Back in July the Filipino American National Historical Society announced that this year the theme would be Turning Points. Why? To focus on three events that changed the lives of Filipinos and Filipino Americans, and the respective anniversaries of those events. 2018 is the 120th anniversary of the declaration of Philippine independence, and it’s the 50th anniversary of the establishment of Ethnic Studies in which Filipino American students played a significant role. For me, when I reflect upon the history of Filipinos in Boston, I can’t help but think of an archived Globe piece I first saw a couple years ago. If you head to the “anti-Filipino sentiment” Wikipedia page, the prominent and only picture in the article is the front page of the Boston Globe in 1899. 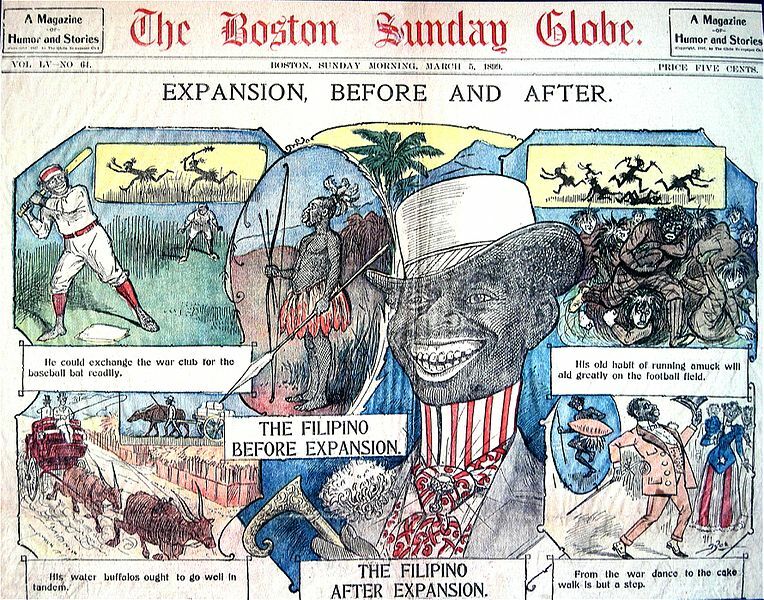 The cover story is titled “Expansion, Before and After” and it features Filipinos in black face depicting what the paper thought the country was like before and after the U.S. came to the Philippines. Seem like fake news? You can check out the whole Globe paper in the newspaper archives. But then I think of other moments, more celebratory moments in history. I met a woman at the Filipino Festival in Malden this year, and she said that her mother used to go to Filipino dances right here in Boston wearing traditional dress. And then I think of 2018 as a turning point. There continues to be incredible Filipino organizations collaborating (which we really need to list here on the site - I’m on it! ), and Filipino pop-ups continue to increase. BOSFilipinos celebrated its first birthday. Chef Ellie Tiglao is opening up a restaurant in Somerville. There are 2 feature length films showing at the Boston Asian American Film Festival (will link to a FB post with discount code). The Filipino Festival in Malden hit some record numbers, and is outgrowing its space. And still, there’s room to really pick up the pace. To truly make history in this community (and well, beyond), I do believe that requires collaboration and inclusivity. So if you’d like to be more involved with BOSFilipinos, whether you’re Filipino, Asian, or just want to be a part of elevating Filipino culture, we hope that you’ll reach out. Whether that’s online or in person (November 1st is our next meetup). Wouldn’t it be amazing to look back on this time here in the city as a time when we really came together to uplift each other’s cultures, whether that’s Filipino or otherwise. PS - To learn more facts about Filipinos in America, check out our post from last year. In particular, you should definitely check out the amazing video Next Day Better / AARP put together (my favorite quick history lesson on the FilAm experience if you ask me! ).